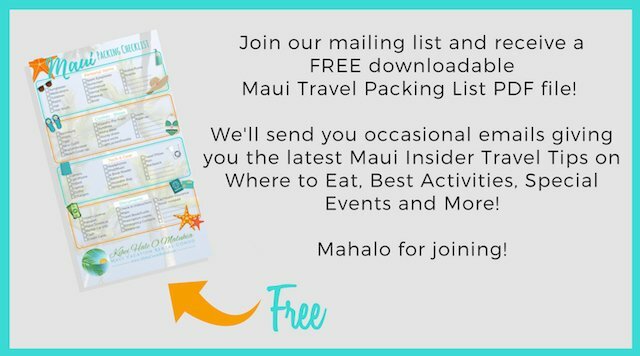 You come to Maui for the tropical island experience! 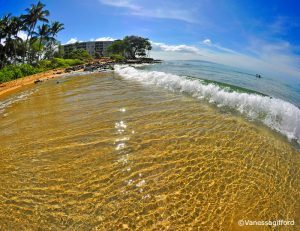 You won’t find a more diverse range of beaches than you do on Maui. Everything from fluffy ‘brown sugar’ sand to black sand to red sand and just about everything in between. 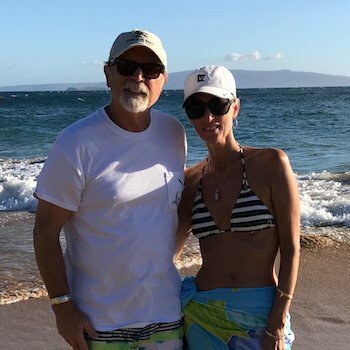 We’re fortunate that our vacation rental condo is right next to one of Maui’s most popular beaches. 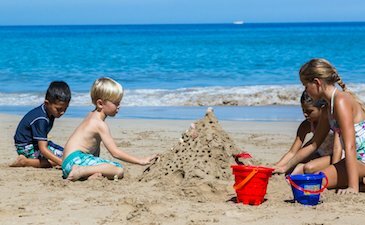 The Kamaole (pronounced kah-ma-oh-lay) beaches consist of a 1.5 mile stretch of three linked beaches. Called the ‘Kam’ beaches by locals, they are designated by I, II or III. Each beach is flanked on either end with nice rock outcrops that provide great snorkeling where you’re sure to encounter Honu (sea turtles), tropical fish in a rainbow of colors, sea urchins and more. 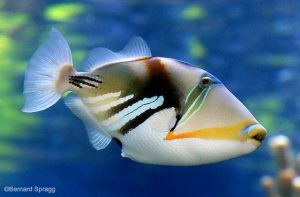 Keep your eyes peeled for our famous Humuhumunukunukuapua’a, a reef trigger fish and Hawaii’s state fish! Our condo is outfitted with everything you need to spend the day at the beach. Four Tommy Bahama beach chairs, a large deluxe umbrella, a sand free beach mat, sturdy cooler with ice inserts, and best of all, a beach-wagon to take it all to the beach. Are you ready to pull up a chair and dig your toes into the sand? C’mon, we’ve saved you a seat! Kam I is a great swimming beach with a lifeguard station. The north end is locally called ‘Charlie Young Beach’ it tends to be less populated as the lifeguard station is on the south end. We’ve watched many wonderful sunsets from the bluff at the north end of this beach. Our vacation rental condo is just a few hundred yards from Kam II, and we think the best of all three beaches. It’s like the Goldilocks of beaches, not too big, not too small. Never feels crowded. Lifeguard station, showers and bathrooms and nice picnic areas make it the perfect beach, it’s just right! Bring the boogie boards provided in the condo and enjoy! With it’s large grassy park area, Kam III is very popular with local crowd. On weekends you see bounce houses, lots of family get-togethers and BBQs going on. This beach has a nice shore break for boogie boarding or body surfing. The rocky outcrops at either end of all three beaches provide some great snorkeling. 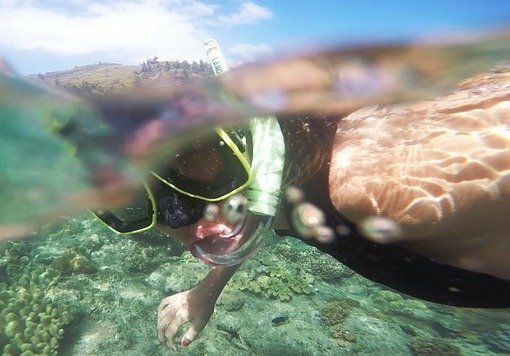 The best time of day to snorkel is early in the morning before the trade winds pick up and churn up water. We’ve provided some basic snorkel gear and our condo is just a few minutes walk from several snorkel gear rental companies if you need more. Please take care of the coral reefs! It’s a delicate ecosystem. Remember, ‘If it’s sand, it’s ok to stand’, grabbing, standing or walking on coral can damage or even kill it. 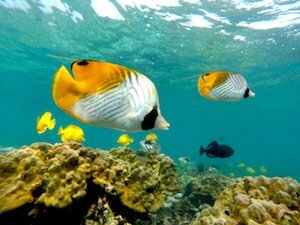 Live Aloha and please stay off the fragile coral ecosystem. This is a goofy little video on reef etiquette but it’s very important information.